This Championship really got its start back in 2017 with some rules changes that allowed something other than a turbo Busa to have a real shot at winning races and possibly a championship. Stotz Racing got to work trying to make the big changes all work together in unison. Longtime friend Steve Nichols from Maxx ECU got us the latest Race ECU and helped us with the data to get the M2 Shock dialed in and apply the power to our chassis. We had been stuck in the 6.90 ET range for 3 years. 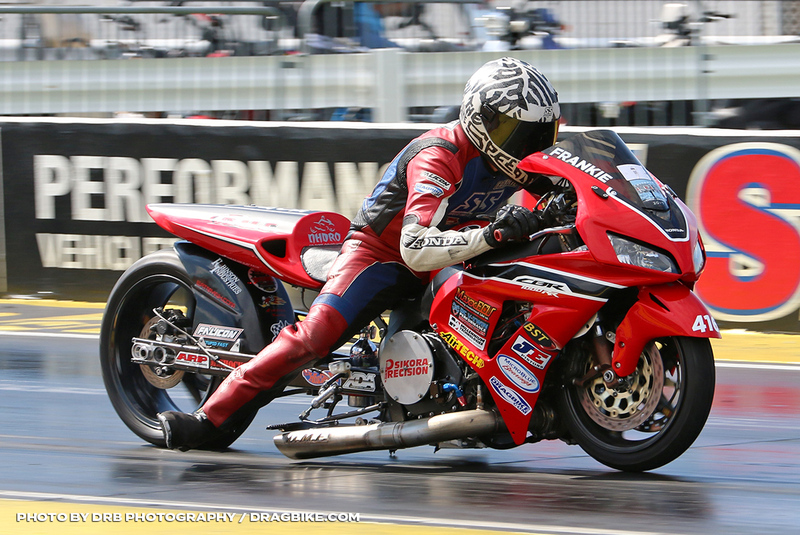 Finally in August of 2017 at the NHDRO race we got a combination together and Frankie blasted from the 6.90’s to a 6.77! He had never even been in the 6.80’s yet. This was no one-hit wonder though. He went 6.70’s the remaining races of 2017 finishing off the 2017 season at the last Man Cup race qualifying #1 with a 6.70 flat. The offseason, Dec-March had us in the shop reviewing all data and notes to add more consistency to our performance. Kurt from Sikora Precision was making all the new custom machined parts. We had DME building us a whole new turbo system with their bad to the bone Owens turbo. DC V-Twin did two trick heads to match the custom JE Pistons. Dallas Honda supplied cases prepped by Millennium Technologies and coated by MicroBlue Racing. We had the best of the best helping us. We had a weak link in our program and billet cranks would fix that. Thanks to American Honda, they stepped up and helped us with funding to purchase the mandatory minimum of 5 billet cranks. This along with Falicon Knife Rods completed our preparation for a real attack on the 2018 National Champion. The 2018 spring opening schedule had 3 races in a row and we capitalized on it by winning two out of three. Great way to start any season! The following races had us qualifying #1, 2 or 3. The only thing that kept us from the winner’s circle was we had found the next weak link. The transmission. Billy Robinson and I go back 35+ years. He has always done our trans work and when Honda asked us to switch from the Blackbird to the CBR1000RR he was amazed the pro cut stock trans (designed for 200 hp) held up to the 470 hp we made for over 10 years. I know we are making more power now and the trans does too! We broke 5 trans this year (broke 5 cranks last year). Bad things don’t come in threes for us they come in fives, lol. Robinson Industries has made us a billet trans and BST got us their new 7 spoke wheel for the last race of 2018 at SGMP in Valdosta, Georgia. I’m sure we will find and fix the next weak link over time, but that’s what racers do. I only hope it ends in another Championship Season for 2019. We hope to see you at the World Finals in Georgia. 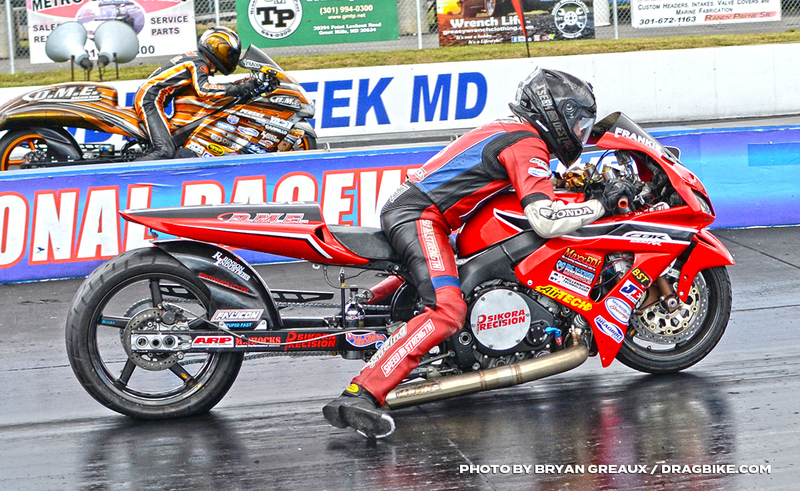 Now FIVE Time AMA ProStreet Champions Stotz Racing, first 200mph record and first Turbo Pro-Street in the Sixes (6.98) thank American Honda, prohondaoils.com, Dyno Dynamics, Sikora Precision, DME Racing, Al Lamb’s Honda, Falicon Crankshaft Components, BST Wheels by Brock’s Performance, Robinson Industries, DC V-Twin, JE Pistons, MicroBlue Racing, Air-Tech Streamlining, M2 Shocks, Worldwide Bearings, ARP, Win Racing, Millenium Technologies, mobiledynamometer.com, and the newest Maxxecu.com.